This Website and the contents provide information about the company to the target audience. Users are permitted to save, display or print out information contained on this Website only for personal reading and commercial dealings with the company. Except as otherwise permitted by these terms and conditions, users are not permitted to modify, copy, distribute, transmit, display, reproduce, publish, license, frame, link, create derivative works from, transfer or otherwise use in any manner, in whole or in part, this Website or the information and materials on this Website. The Website may also provide links to other websites. These links are provided solely as a convenience to Users. IDBI Intech is not responsible for the privacy practices or the information or content of these websites. Users shall bear all risks associated with the use of such websites. Except as otherwise stated on the Website, all information or content on the Website is the exclusive property of IDBI Intech. 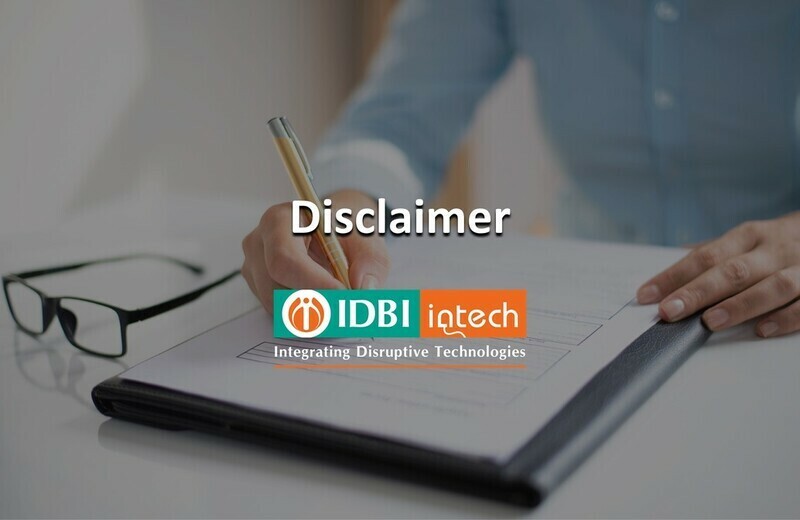 No information or content on the Website may be copied, modified, reproduced, republished, uploaded, transmitted, posted or distributed in any form without the prior written consent of IDBI Intech, except as otherwise specifically permittedon the Website. IDBI Intech is not responsible for the content of websites to which it may provide links. IDBI Intech uses all reasonable precautions to keep the personal information disclosed within the organisation in a secured environment.